First: a thank you to Truecouponing.com for the above photo. It’s a great example for today’s post! Take the above photo as the “stereotypical” holiday meal. Unless you’re a truly gourmet chef, with staff, who can hope to put together a meal that looks like that, while still managing to get a full night of sleep? And this is mixed in with all the fun and games of hosting, serving normal meals the rest of the day, as well as snack foods during the day, and whatever other holiday activities are happening. And then there’s the desert… Sounds daunting, right? Well, it is!! In addition to the above, we haven’t even started to consider the meal from the different dietary choices that any individual is likely to have made: about 30 million vegetarian-inclined people, gluten free people, lactose intolerant people, and the full-on paleo people… There’s a lot to keep track of as the chef of “the big meal” isn’t there?! In my experience, the meal planning is one of the biggest causes of stress during the holiday season, for any of the holiday meals. Deserts, sides, entrees; how to please everyone and not offend anyone. Well, hopefully I can offer a few suggestions, some recipes, and some ways to keep the spread looking and tasting good while giving a little bit of respect to each of the dietary traditions out there. And I really hope that you’ll love them! Even if you can’t or don’t want to follow my meal plan, I’ll be just as happy if it gives you some ideas that you can take away for your own meal and meal planning. That’s quite a line-up, right? 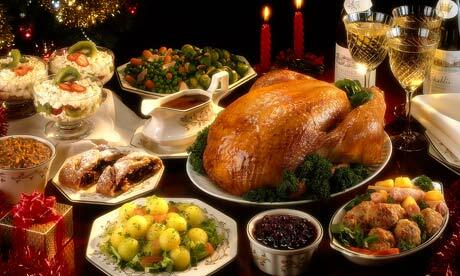 Well, there are two different kinds of people who may be (still) reading this: you may actually be the chef putting together the full holiday meal for a large group of people. In that case, you’ll want to think about putting together the entire line-up I have listed above, or perhaps incorporate the above in with your already existing plan. Or you’re cooking for a smaller audience (or bringing a dish to a pot-luck style meal). In that case, you’ll want to consider a smaller version of the above, perhaps the ham, the ‘slaw, and the greens. Or another variation, as it suits you. Ok, so the instructions will be quick, since there’s a lot to get to here! First, whatever size ham you chose, remember the roast rules: 20 minutes per inch of thickness. Make sure to plan ahead for that! Now, lightly coat the inside of the roast pan with coconut oil, and roast the ham, uncovered for half the total roast time at 375 (if 3 inches thick, total time will be 60 minutes, so half is 30 minutes). At half, make a basting sauce with the coconut oil, coconut butter, sage, ginger, and blueberries (put them all in a sauce pan, cook on low heat until they are well combined and thickening, then turn the heat off). Baste the ham lightly every 10-15 minutes (paint the exposed portion of the ham with the sauce you made). Be sure to use all of the basting sauce throughout the remainder of the ham cook-time. The ‘slaw sauce first: warm the coconut cream, coconut butter, and shredded coconut in a pan, mix until the sauce is fully mixed, then let cool. In a mixing bowl, combine the shredded veggies, the spices, and the apple cider vinegar, and let it sit for at least 20 minutes (60 minutes is better, if possible). No more than 20 minutes before serving, combine the shredded veggies with the ‘slaw sauce and mix thoroughly. This is so-named because it is intended to be a vegan friendly salad, so it should be served to people of all dietary flavors! In a saute pan, combine the coconut butter, chopped carrot greens, chopped green onions, and chopped mushrooms, and saute for 4-5 minutes on medium heat, or until the green onions start to uniformly darken. In a salad serving bowl, combine all ingredients, and the sauteed ingredients, and mix thoroughly. Add more almond or coconut chips, as desired for flavor. Add more dried cranberries as desired for color. Like the All-Flavors Greens, this dish may be enjoyed by all! Peel and chop the parsnips, potatoes, and ginger and boil them down to a mash, then add coconut butter and mash with a potato masher. Slice the vegetables, garlic, and ginger. Put some coconut oil in a frying pan, and heat the pan on medium heat. The pan should be hot when you add the vegetables. I suggest using long slices for the carrots, parsnips and zucchini, so that they are similar length to the red pepper. Add the carrots and parsnips to the pan first, and fry them for 3-5 minutes, or until they start to soften, then add the zucchini. Continue to heat for another 2 minutes, stirring regularly, then add the garlic and ginger, and reduce the heat to medium-low for another 2 minutes. Stir constantly; you want these to be “toasted” but not cooked through, and definitely not burned. Once the vegetables start to have some toasting marks on them, little brown spots from the heat, turn the heat off, but leave the pan on the burner. Add the rest of the spices, mix thoroughly, and leave this to cool. Now take out the black olives and drain them. Put them on a cutting board, and with your thumb, crush each one so that it’s crushed in to halves or quarters. Add these to the pan and mix again. In my home, holiday meals like this are served in a spread, and we all take our dishes to the spread and serve ourselves. So the only additional instruction, over and above the instructions already given: slice the ham before adding it to a serving dish. And enjoy!! I wish you all the best with your holiday meal preparations, and I hope that my above thoughts and ideas have helped! As a note: “What’s For Dinner?” will be less regular through the Christmas to New Years week, as I am travelling. I will make sure to have other meal-related posts up for you to enjoy. Thanks! Some are older recipes from previous posts, and some are brand new. I am really excited about this meal! !